Presenting the Argentine Dinner. The sweet lobster-like taste of extra-large Wild Argentinian Red Shrimp from World Port Seafood. Plus, with easy freezer-to-oven sides and an ultra-rich cheesecake for dessert, this world-class combo is everything. Quality and freshness matter in seafood - whether you live by the coast or in Colorado. With World Port Seafood�you get an expertly curated selection of seafood favorites that are ready to ship directly to your door each harvested from top sources all over the world, quickly frozen for true freshness and flavor, and delivered flawlessly. Confidence, quality, and convenience come in every cooler. 16 oz. pkgs. �| �1 pkg. Despite their appearance, Argentinian Red Shrimp are RAW. Cook until shrimp are opaque and reach a minimum internal temperature of 140�F. Season as desired. FROM FROZEN Stovetop, Steam: Add 2 inches of water to a saucepan and insert steamer basket. Heat water to a boil using medium high heat. Remove shrimp from bag, add to steamer basket, cover and boil for 6-8 minutes. Stovetop, Saute: Preheat small amount of oil in a non-stick skillet over medium heat. 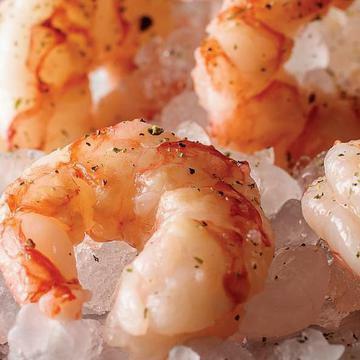 Remove frozen shrimp from packaging and carefully place in skillet. Cook covered for 3-4 minutes on each side or until the shrimp are cooked through. GRILL: Preheat grill with lightly oiled grilling pan to medium. Remove frozen shrimp from packaging and add to pan. Cover pan and grill 4-5 minutes on each side or until the shrimp are cooked through. FROM FROZEN: Take out desired number of cheesecakes from freezer and remove outer plastic wrap. Carefully remove cheesecake from cup by pressing the bottom of the cup with thumbs while holding the edges. Place on a serving plate and thaw for approximately 2 hours at room temperature or 5-6 hours in the refrigerator covered with plastic wrap. Store any unused portions covered in the refrigerator for up to 7 days. Contains: Crustacean Shellfish (Shrimp), Sulfites. Ingredients: CREAM CHEESE (PASTEURIZED, CULTURED MILK AND CREAM, SALT, STABILIZERS (XANTHAN AND/OR CAROB BEAN AND/OR GUAR GUMS)), SOUR CREAM (CULTURED PASTEURIZED GRADE A MILK, CREAM AND NON FAT MILK SOLIDS, MODIFIED FOOD STARCH, SODIUM TRIPOLYPHOSHATE, GUAR GUM, CALCIUM SULFATE, CARRAGEENAN AND LOCUST BEAN GUM, POTASSIUM SORBATE), SUGAR, SHORTENING (SOYBEAN OIL, VEGETABLE MONO & DIGLYCERIDES, TOCOPHEROLS (VITAMIN E) AND VITAMIN C PALMITATE (AS ANTIOXIDANTS), EGGS, MILK POWDER, FLOUR (WHEAT FLOUR, MALTED BARLEY FLOUR, NIACIN, IRON, THIAMINE MONONITRATE, RIBOFLAVIN, FOLIC ACID), MELO JEL STARCH, VANILLA EXTRACT, CRUST (ENRICHED FLOUR, WHEAT FLOUR, NIACIN, REDUCED IRON, THIAMINE MONONITRATE, (VITAMIN B1), RIBOFLAVIN (VITAMIN B2), FOLIC ACID), HIGH FRUCTOSE CORN SYRUP, WHOLE WHEAT FLOUR, VEGETABLE OIL (SOYBEAN OIL, PALM OIL AND PALM KERNEL OIL), CONTAINS 2% OR LESS OF BAKING SODA, SALT, HONEY, MARGARINE (INTERESTERIFIED SOYBEAN OIL, WATER, SALT, MONO AND DIGLYCERIDES, COLORED WITH ANNATTO/TURMERIC, CALCIUM DISODIUM EDTA ADDED AS A PRESERVATIVE, ARTIFICIAL BUTTER FLAVOR, VITAMIN A PALMITATE ADDED), SUGAR, VANILLA, CINNAMON). CONTAINS: WHEAT, MILK, EGGS, AND SOY. MANUFACTURED ON EQUIPMENT THAT ALSO PROCESSES PRODUCTS CONTAINING PEANUTS AND TREE NUTS.